Trail Alerts inform hikers of situations encountered at trailheads or while hiking on a trail or, if you are a trail builder or maintainer, trail alerts inform fellow hikers of relocations to the trail or changes that affect safety. ​Attention Clubs! If you would like KTA to post your Trail Alerts, we will be happy to publish your alert and share it on social media. ​It will be your club's responsibility to let KTA know when the Alert should be taken down. To report major problems that need the attention of a trail crew or maintainer, such as incursions onto our trails, washed out bridges, sections of trails which have been shutdown by landowners, please fill out this FORM. KTA will alert the proper manager or agency to solve the problem. 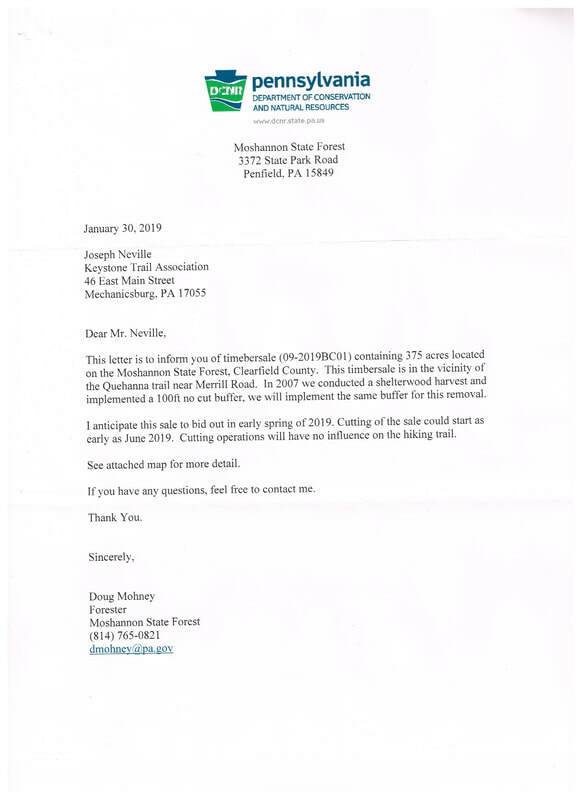 Pennsylvania's trails and trail users will thank you! Slate Run Road in the Tiadaghton State Forest is closed from Francis Road to the Manor Fork Road due to multiple landslides. 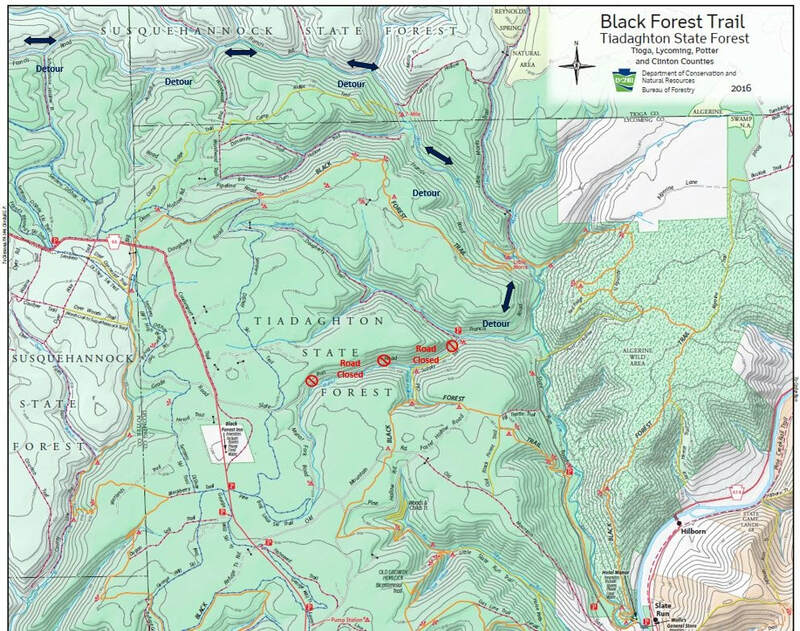 Hikers can still access the primary trailhead for the Black Forest Trail on Slate Run Road via PA 414, or via the Francis Road if driving to the trailhead from PA 44. Due to the severity of the of the landslides, major construction projects will be required to rebuild the road. The construction is expected to occur in spring of 2019. Chuck Keiper Trail between Fisher Fire Road and Burns Run. Impassable for 1/4 mile or more. Black Walnut Bottom, Tomb Flats, and Naval Run campsites will be closed to camping starting July 23, 2018, due to nuisance wildlife. District staff intend to reopen the areas to camping on August 24, 2018. Please contact the district office at 570-753-5721 for more information. These trails may re-open later this summer. A portion of the Old Loggers Path that runs on Pleasant Stream road in Masten will be impacted by a major road construction project. See Pleasant Stream Road/Hillsgrove Road advisory for more information on the project. Hikers using this portion of the trail are advised to use caution near the construction area, avoid active construction equipment/vehicles, and heed any safety signage or guidance. There may be times when it’s necessary to ford Pleasant Stream and bypass the construction site by traveling adjacent to the road, through the woods, for a short section. The OLP trailhead at the Masten Camping Area will remain open during the project, however, hikers are encouraged to use the Krimm road trailhead/parking area off Ellenton Ridge road to avoid the construction activity. Glenn O. Hawbaker, Inc. will begin a major road construction project at the intersection of Pleasant Stream road and Hillsgrove road on Tuesday, June 5, 2018. This $900,000 project is to repair damage caused by the 21 October 2016 flood event. Work will include building demolition, road reconstruction, culvert repair, roadbank/ditch stabilization, debris removal in the Pleasant Stream channel, and road resurfacing. The work area will extend from near the old trestle on Upper Pleasant Stream road, west through the intersection to the beginning of the large slide near Short Run. There will be heavy truck traffic on Masten Township road and the open portions of Pleasant Stream road. The Masten Camping Area and Old Loggers Path Trailhead will remain open during construction, but visitors should use caution when accessing these sites and not leave vehicles near or in the way of construction equipment. There is no projected completion date at this time. Hikers should be informed that the only access to the mile zero trailhead, at Masten might be solely by upper Pleasant Grove Road (toward Ellendale). Stream road is closed. Mill Creek Road is closed. Big Hollow Road is closed. Masten Road is closed from the quarry down to Masten as of this date. See map HERE. If you belong to a trail club, consider scheduling a work trip to repair the damage on the Old Loggers Path. BOF has relocated the most difficult section at mile 16.84 where it crosses Pleasant Stream. Please coordinate with BOF to find other critical areas. This trail needs your help.